I didn’t want to cook for 6 people (so I changed the quantities and didn’t always keep the same proportions). I usually make dinner for 2 but actually cook for 4 so we can have left overs for lunch the next day! Since I could not find any currants, I decided to get creative (and to be honest, I took a bit of a risk)! I replaced them with pomegranate. It seemed like a good alternative and I thought it would bring a little bit of “pizazz” to the recipe. 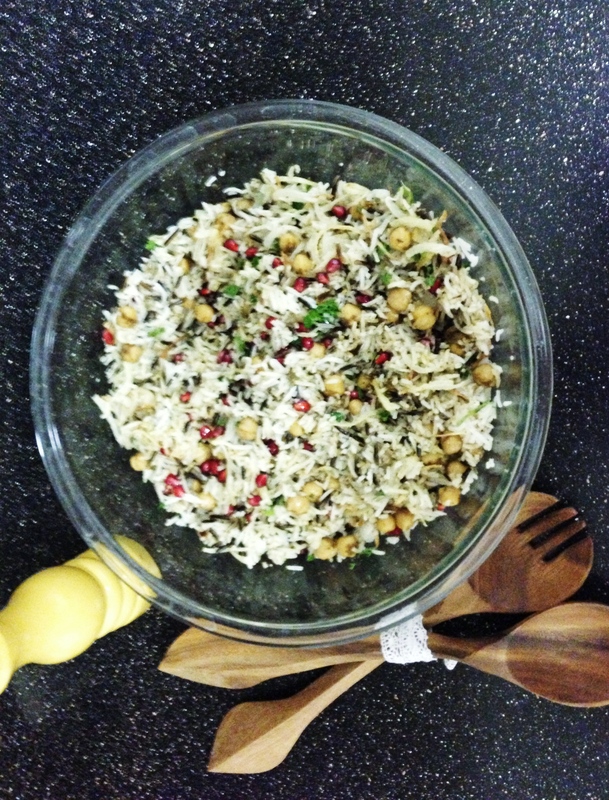 So I guess my version should be called “Basmati & wild rice with chickpeas, pomegranate & herbs.” I decided to call it: Middle Eastern Rice Festivities. The end-result was a delight! A great flavorful vegetarian dish. I will most definitely cook this dish again. I think it is a good option to keep in mind for big gatherings. In a medium pot, cook the wild rice in a lot of water for 40 min. In a medium pot, heat some olive oil. Add basmati rice and cook for 2 to 3 min (until golden). Add the 3 cups of water. Cook for 20 min. Meanwhile, heat 2 tbsp. of olive oil in a medium pot. Add cumin and stir for a few seconds. Immediately add the chickpeas and stir for 30 seconds. Transfer chickpeas in a bowl and set aside. Wipe that same medium pot clean with some paper towel. Add the vegetable oil. Heat oil. Meanwhile, mix thinly sliced onion with flour. Once oil is hot (careful not to burn yourself), add onions one small cup at a time. Cook for 3 min or until golden. Repeat same action until all onions are cooked. 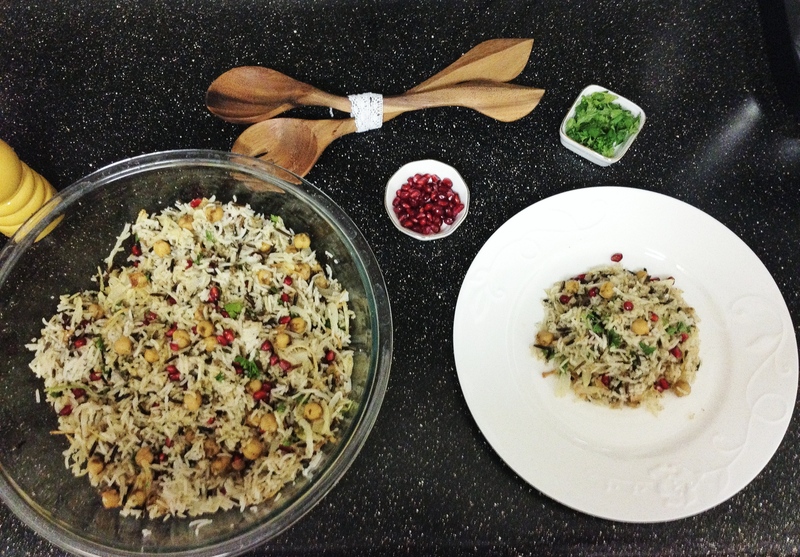 In a big bowl, mix both types of rice, chickpeas, pomegranate, parsley, cilantro, onions, salt and Pepper. Stir. Serve warm. Movie to watch after dinner: Aladdin (1992). I love Disney movies. I’m still a big kid at heart. I know most of the songs in that movie, but I know all of them in French, since I didn’t speak English until I was 17! I love this kind of food. Yummy. 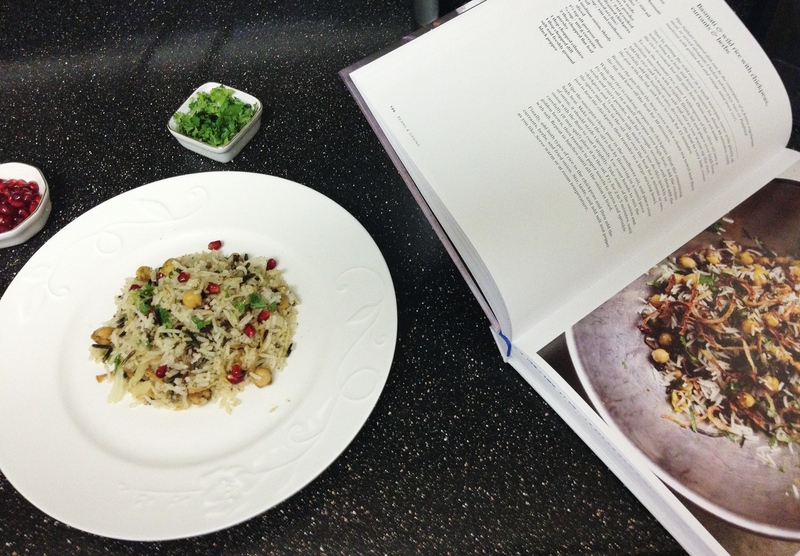 I must get the Ottolenghi book I have his two previous ones, and use them all the time; they are great. I love how he uses wild rice in this recipe, which is typically North American, but for a very Middle Eastern result. Concernant la question de Laure, currants désigne généralement les petits raisins de Corinthe, alors que raisins désigne plutôt les raisins blonds (plus gros), genre sultanines. Pour ma part, je préfère les petits, mais ils sont plus chers en général. Les groseilles, ce sont les “red currants”, mais ce n’est généralement pas ce que veut dire Ottolenghi dans ses livres. That was the first recipe of the book that I tried and it was excellent! Merci pour la clarification sur les currants. Je vais reéssayé la recette avec les petits raisins de Corinthe. J’ai enormément aimé ma substitution avec la grenade, c’était un peu par accident mais les meilleures recettes se font ainsi! Okay, so this means you will experiment with every recipe in your new cookbooks and Oran and I can taste all!! Love the substitution. I will keep my eyes open for currants. For the next recipe I try, you guys will be the official tasters! Il faut en effet une bonne dose de capacité d’adaptation car je n’aurais jamais imaginé que les raisins secs auraient pu poser un problème… Tu me diras je croyais bien que les spaghetti c’étaient facile à trouver et pas cher!!!! Gros bisous à toi et au chanceux testeur!!! Currant ça veut dire raisins secs ou groseille! Je cherchais des groseilles (que j’avais trouvées la semaine d’avant à Whole Food!) car je pensais que ça irai bien avec le plat (et je ne suis pas fan de raisins secs!). T’as surement raison donc la recette originale à des raisins secs. A refaire, mais j’ai beaucoup aimé avec la grenade. Ça se mari superbement avec le riz basmati et le cumin et ça rend le plat « rafraichissant ». Comme quoi, les problèmes de traduction peuvent aider à créer des recettes originales !